Life on Mars – Real or Illusion? Life on Mars? Well, bizarre images have emerged showing a mystery female figure walking down a hill on the arid planet. The photo of what looks like a naked woman with her arm outstretched was among several taken on the red planet and sent back to Earth by NASA’s Mars explorer Spirit, the Daily Mail reported on Wednesday, citing an unnamed website. 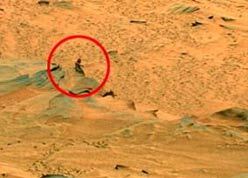 Though no official confirmation has come from NASA whether the figure is an alien or an optical illusion caused by a landscape on Mars, it has set the Internet abuzz that there really is life on Mars. These kinds of speculations are not new. Earlier also they have popped up just to find out later that they were wrong or perhaps too early to comment, as you can find in the article Unmasking the “Face on Mars” in NASA’s site. New high-resolution images and 3D altimetry from NASA’s Mars Global Surveyor spacecraft reveal the Face on Mars for what it really is: a mesa. Twenty five years ago something funny happened around Mars. NASA’s Viking 1 spacecraft was circling the planet, snapping photos of possible landing sites for its sister ship Viking 2, when it spotted the shadowy likeness of a human face. An enormous head nearly two miles from end to end seemed to be staring back at the cameras from a region of the Red Planet called Cydonia. so what does CJ-02 do now since his ex has come to an end.. take revenge?? How hot or cold is Mars and has there been people on mars ?